I’m told that the first soap was the result of animal sacrifices made on a mountain. When it rained the animal fat and ashes would be washed down the mountain into the river where women were washing their clothes. Evidently, they eventually put two and two together and began to deliberately make the stuff themselves. It makes sense because how else would anyone think to mix these ingredients together to make a product that today we use to clean our clothes, our homes, and our bodies? And how they figured out the exact proportions to use is beyond me. I admire their ability to create such an amazing concoction without a recipe to guide them. My amazement stems from the fact that sometimes I still mess up a batch even when I think I’m carefully following the instructions. Then I think about my own grandmother that made soap out of the lard rendered from their hogs. My mother remembers the large black kettle set over a fire out in the yard where lye fumes were not as likely to take your breath away. I’m sure my grandmother was taught this skill from an early age and continued the practice long after I was born. I can still remember the clean smell of that soap when we went to the farm on frequent visits. Purchased soap and indoor plumbing didn’t come to their home until I was a teenager. A number of years ago my family stumbled upon a community of plain folk (not Amish) that sold their eggs, canned goods, homemade bread, crafts, and soap out of their homes. In this community, Marsha was the soap maker and any time we were close to her neck of the woods, we’d swing by to pick up her wonderful candles and soaps. One day I expressed an interest in learning the skill and she was more than happy to show me. However, she lived a long way from my home and with no phone, it was hard to make plans for a time she was making her soap. Then one day I was looking up videos on YouTube and there she was. A woman that didn’t own a phone or television or anything else that used electricity was on YouTube! Apparently, one of her neighbors had a “How-To” channel and had asked her to show her viewing audience how to make soap. I watched the video again and again, writing down the instructions and watching her pour and stir and explain the process in detail. I immediately purchased the list of ingredients and set to work. It was an amazing experience and I was hooked! That was six years ago and now I use my own soap for bathing, to make my laundry detergent and liquid soap, as well as sell it to others! This soap making has also led to adventures outside my home. At Trevecca Urban Farm I make all their soaps to sell at the farmer’s market which means I’m usually making at least one batch a week. 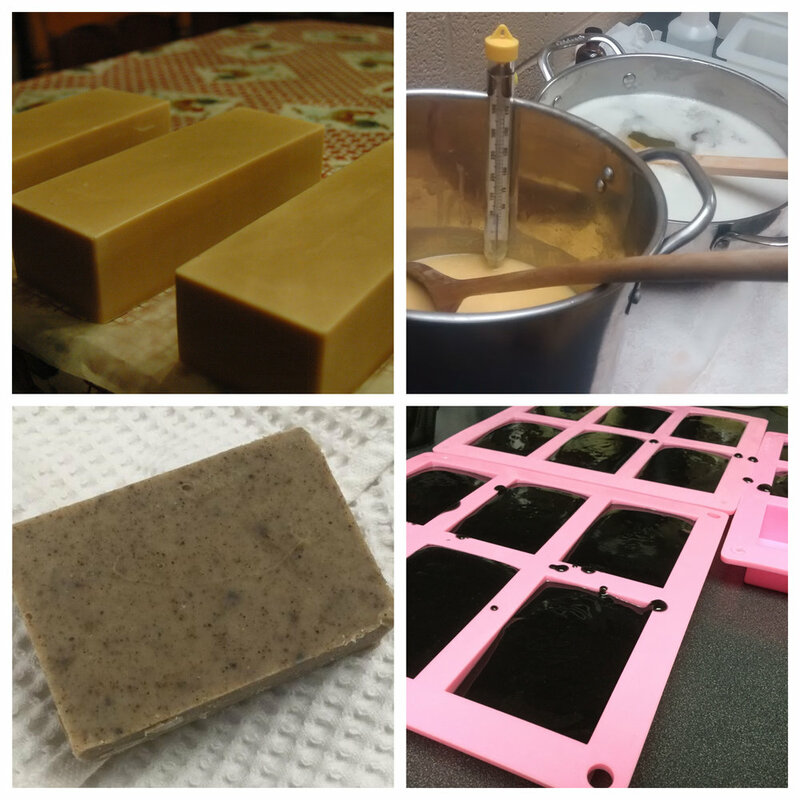 Now that I’ve had a few years of practice, I’ve learned to make a shampoo bar, an activated charcoal bar, a mechanic’s bar with pumice and ground walnut shells, and a honey and oatmeal bar that uses the honey from our bees. For the first number of years I made soap using goat’s milk but once we quit milking our goats and got pigs, I switched to a lard-based soap. Which brings me full circle – back to the mountain, back to my grandmother and the amazing journey of soap making. If you’d like to learn how to make soap, check out the YouTube video of Marsha’s - she’s a great teacher! https://www.youtube.com/watch?v=kHZ9QNBc6so Happy soap making!